Killer Klowns from Outer Space Konquer Horrorhound! One of the highlights of any convention is of course meeting the actors and actresses that starred in so many of our favorite films. Though my priority for HorrorHound was the horror hosts, there were a handful of celebrities that I also wanted to meet. 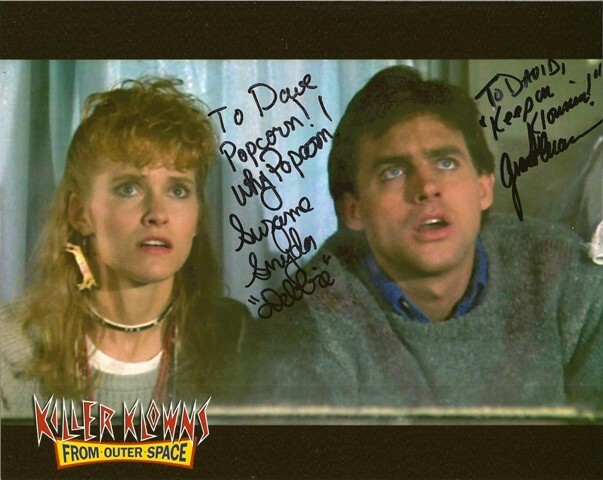 Two of them starred in one of my favorite cult films of the 1980’s, KILLER KLOWNS FROM OUTER SPACE. It’s hard to believe that it has been over 20 years since this cult classic was released. I still vividly remember seeing it for the first time on VHS with some friends. We were of course drinking beer at the time and we just had the best time. I remember wondering to myself if the reason I enjoyed this film so much was because of the beer, or because it was a genuinely good film. Thankfully, at the time, my uncle owned the only video store in Jamestown so I was able to see what ever movies I wanted, when ever I wanted. I re-watched this movie without the aid of alcohol and to my pleasant surprise, it was just as good the second time! The cheese factor in this movie is at an all time high and that is really what gives it its charm. 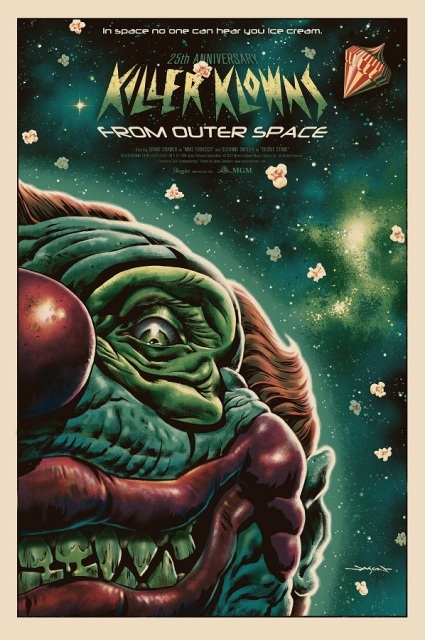 The Chiodo Brothers, who wrote and directed this film, take the most ridiculous premise (aliens that look like clowns who feed on humans after putting them in cotton candy cocoons) and present us with a film that is not only charming and stylish, it’s also a helluva lot of fun! Looking up quotes and getting ready to film a promo with Chuck DeClown. The story borrows the plot of many monster movies from the 50’s: a bunch of teenagers witness aliens or monsters and none of the adults believe them. It is then up to them to save the world on their own. The lead teens in this film are Mike and Debbie (played by Grant Cramer and Suzanne Snyder). While out on a date they witness a shooting star and decide to go look for it. What they find is not a meteor, but a circus tent, in the middle of the woods. Thinking it odd to put a circus literally in the middle of no where, they decide to investigate further. It is here that they discover alien clowns who have guns that shoot popcorn and balloon animal pets that are alive. After being chased by the clowns Mike and Debbie go to the police station to report it to Dave (played by John Allen Nelson), the acting police chief (and Debbie’s ex-boyfriend). Playing bad cop opposite Dave’s good cop, is actor John Vernon in the role of Officer Mooney. Rounding out the cast are Michael Siegel and Peter Licassi as the Terenzi Brothers. Though shot on a reported modest budget of $2,000,000, this film is much better, in my opinion, than some of the blockbusters of today. The story is fun and it never slows down, always keeping the viewer interested in what is going on. It is full of all kinds of great sight gags and the clowns themselves are genuinely scary to behold. In fact, the clown designs are so popular, they have been constantly available as collectors’ masks from companies such as Death Studios, Bump In The Night Productions and now DarkSide Studios. It is because of these mask lines that Mask-Fest was the official sponsor of Grant Cramer, Suzanne Snyder and Harrod Blank being at HorrorHound Weekend this past March! For me it was an honor to meet Grant Cramer and Suzanne Snyder. Though I had never seen Grant in any other films, I was very aware of Suzanne Snyder from such films as WEIRD SCIENCE, NIGHT OF THE CREEPS and RETURN OF THE LIVING DEAD PART II. I will also say that at times, it is disappointing to meet stars such as this after 20 years because you never know how they are going to look or act. Both of them get high marks in my book! I visited them both twice over the weekend, because I was so impressed with them. They were fun, funny and both looked great. In signing autographs Grant actually looked up quotes on his phone that he and Suzanne could use in signing! To me, going this extra mile, meant so much! So many stars just sign their name so the fact that they were willing to write out full quotes was just amazing to me. In my opinion, other celebs should take lessons from both Grant Cramer and Suzanne Snyder! They were both class acts all the way and helped raise the bar of the whole event! This entry was posted in Big 80's Horror!, Celebrity Encounters!, Convention & Expos and tagged Chiodo Brothers, Chuck DeClown, Circus, Clowns, Grant Cramer, HORRORHOUND WEEKEND, John Vernon, KILLER KLOWNS FROM OUTER SPACE, Mask-Fest, Michael Siegel, Officer Mooney, Peter Licassi, Suzanne Snyder, Terenzi Brothers. Bookmark the permalink. 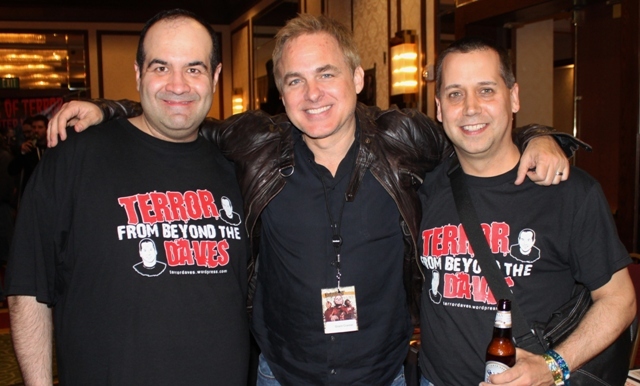 ← Horrorhound Horror Host Hall of Fame 2011!